Museums & Nature Centers – Tour Guide Mark – Let's Go Exploring! Exploring the stories, trails, and unexpected places of Oregon, Washington, and California. Tour Guide Mark – Let's Go Exploring! On this sunny day in November, our small group of Obsidians spent several hours with the original writings, journals, and photographs of a true champion of nature – John B. Waldo. Waldo was an ardent conservationist, he’s been referred to as the west’s David Thoreau and even Oregon’s John Muir. Waldo was known for venturing into the Cascades, often spending months at a time, and recording his findings of this dynamic and vibrant landscape. Over the course of his life, Waldo worked as an explorer, legislator, and chief justice on the Oregon Supreme Court, all the time helping to preserve land in the Cascades. He envisioned a protected band of land along the crest of the Oregon Cascade Range that ran the entire length of Oregon. This goal became his personal mission. On September 28, 1893, the Cascade Range Forest Reserve became a reality and 5 million acres were protected. Today, we can experience his legacy in the protected lands and open spaces of the Cascades from Mount Hood south to the border with California, that include: Crater Lake National Park, Mt. Hood, Willamette, Umpqua, Rogue River national forests, and other public lands. And in the middle of this grand monument are the deep and pristine waters of Waldo Lake, named in his honor. Curiously, little is written about Waldo. The judge was a philosophical and reflective person who did not directly seek publicity. But possibly this muted message is part of his larger voice – appreciating the beauty of Oregon is best experienced by hiking on the trails, exploring in the mountains, traveling in the wilderness, and experiencing the (as he wrote) “untrammeled nature and the free air.” Discover Waldo’s story for yourself. 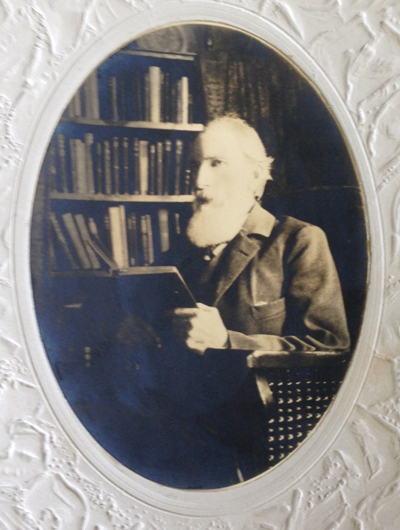 The University of Oregon archive is free to use – Knight Library, Paulson Reading Room. A whitewashed adobe fort sits within the busy, modern center of Sacramento, California. 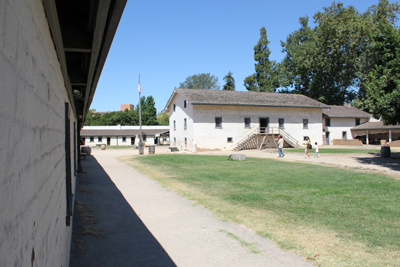 It is known as “Sutter’s Fort’ and is frequented by children learning about California’s pioneering history. But, it is not just for kids; older explorers can discover a thing or two as well. The fort is named after John Sutter an immigrant from Europe who created a massive agricultural empire in California’s fertile central valley in the 1840s. For roughly ten years he controlled all business interests and shaped the activities within the region. In a way, he was California’s first business entrepreneur. But, in 1848 that changed when gold was discovered at one of the mills that he owned along the American River; ‘Gold Fever’ was out. Within several years tens of thousands of gold seekers overran his lands, mills, and businesses. Ironically, Sutter became a pauper in the land where he once single-handedly ruled. It is an interesting chapter of the American West. A reconstruction of his fort remains today. Outside, the fort has thick, adobe walls that are several stories high. Inside, dirt pathways guide folks around fire pits, canvas tents, and wagons. 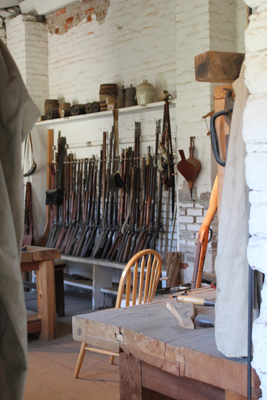 All of the rooms are well stocked with artifacts and exhibits that help to tell the story from that time. Check the calendar for events and special times when visitors can see modern folks who have dressed the part and provide a glimpse into the life of the pioneers. 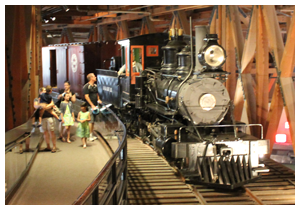 Unleash your inner train-loving kid at the California State Railroad Museum in Old Sacramento, California. I could easily spend another afternoon exploring over 20 restored locomotives and railroad cars, but this is more than just a place about railroads, it tells the story of how trains transformed America. 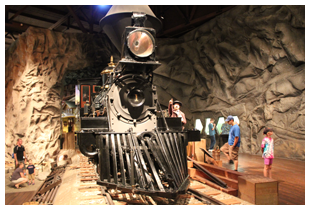 After purchasing tickets you enter a large room with an impressive exhibit about the Transcontinental Railroad. This is an immersive, life-sized diorama that literally pulls the visitor inside to reflect on the arduous task of building a railroad over the rugged Sierra Nevada Mountains. At the center of the experience is a beautiful locomotive. In front of the engine is a tunnel – a masterwork of art – that plays on the eye and appears to continue into the snowy and cold mountains. 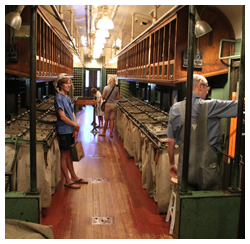 After this exhibit is a second immense room filled with trains and cars – all restored. Woven between these great machines are smaller exhibits that give glimpses and perspectives on how trains influenced a growing free-society in the United States. The exhibits also look at the daily life of train workmen. My daughter enjoyed a restored sleeper car, featured as part of the “Golden Age” of rail travel. Inside, the car was darkened, it rocked and swayed, complete with rail noise and passing light signals through the windows. It really did feel like being in a passenger car at night. The roadhouse is filled with monster-sized locomotives and railcars. Don’t miss out on the postal car, where you can see the organization involved with delivering mail to remote communities along the rail line. Upstairs is a children’s play area, and a sizable model train layout complete with bridges, tunnels and lots of trains for those who want to be eight year’s old again. Make sure to explore the adjoining area, where you walk over a train trestle and get a bird’s eye view of the entire museum. The Open Sea exhibit at the Monterey Bay Aquarium is a visually immersive experience. It allows visitors to see the open ocean at a depth of roughly 25 feet underwater while standing in a comfortably warm viewing room. Visitors enter a dark viewing theater with a 90-foot transparent wall that rises high to the ceiling. In this place, humans appear as dark silhouettes against the blue world beyond where silver and grey sea turtles, sharks, rays, tuna and a variety of other fish are in constant motion. Lances of light piercing into the depths and brightly illuminate any creature that swims through the shafts. I have found that just before closing time at the aquarium, you can enjoy this vista with just a hand-full of others, or in some cases have a precious minute to enjoy it all by yourself. Few symbols represent the spirit of the American West like wild Bison grazing on the expansive and open prairie. There is something about this setting that makes the heart pump a little faster and one’s breathing to quicken. Such a setting whispers about the time when our ancestors lived here, or even migrated across this expansive landscape. It quietly reminds us, in today’s busy world, not to forget their stories about independence, rugged individualism and family. This uniquely American setting is often seen two-dimensionally in movies and TV shows, but a three-dimensional landscape can be explored and experienced at The Nature Conservancy’s Tallgrass Prairie Preserve in Osage County of northeastern Oklahoma. 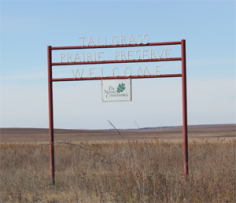 The Tallgrass Prairie Preserve is big. On a map, it covers an area that is roughly 12 miles wide and 9 miles long! 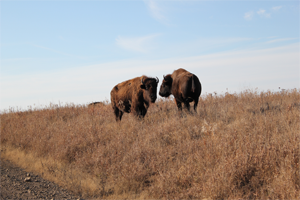 The total acreage is about 40,000 acres, with 25,000 acres reserved for the bison. 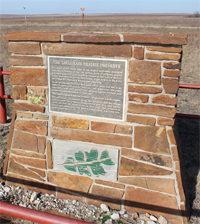 My visit to the tallgrass with my Father started in the town of Pawhuska, Oklahoma, close to the preserve’s southern entrance. The drive down a paved county road was surrounded by woodlands but this soon turned to prairie and the road turned to gravel and then a packed caliche clay. Simple signage marked the entrance to the preserve. The sun this autumn day was shining and the blue sky was punctuated with small white clouds. The wind was blowing about ten miles an hour and the temperature outside was around 40 degrees. Sadly, the area surrounding this marker had been marred by a number of empty beer cans left apparently from the evening before. I later learned the roads leading to the preserve are county roads open to the public at all hours. Although there is a cleanup service provided in the preserve by volunteers they cannot be everywhere and at all times. We spent a few minutes picking up the unsightly and very uncool trash. Twenty minutes or so down the road we stopped at an interpretive marker along the edge of the road. Dark stacked piles of bison poo dotted the area all around us. These were not messy cow patties, rather the dung was tightly packed together into circular disks. These nutrient-rich ‘buffalo chips’ were used by natives and settlers as charcoal because the material burns hot and slow. Further beyond a few dark bison sentinels stood at the side of hills, these were apparently lone males who had been pushed out from the herds. The mature males, after mating, are no longer needed by the female-dominated herds and are excluded. Hawks and kestrels soared over the dry prairie grasses. 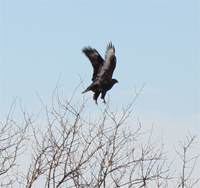 Most of the birds I saw were sitting on fence posts observing their domain, but sometimes one would fly up, soar overhead and then later swoop down and appeared to have caught a rodent in its sharp talons. A herd of bison was just ahead. It was easy to see their dark forms against the dry and brown landscape of late autumn. The bison allowed us to slowly drive past. They did not appear to mind us and continued with their business. If they wanted to the bison could cause us some harm as these are great creatures measuring 5-6 feet at the shoulders and 7-10 feet in length. 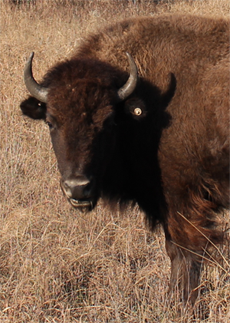 Plus bison can weight up to 2,000 pounds or more! Some of the individuals peered at us through thick, wooly looking coats that would soon protect them from the coming winter cold. We watched them for some time. In the sections of the preserve where we saw fences, the barbed wire included 6 strands and was at least 6 feet tall. We later learned that bison can jump 6 feet laterally and 6 feet in height! The fences are tall so the strands appear at eye-level to intimidate the great beasts from jumping over. We passed another two groups of bison close to the road. The ‘Bison Loop’ road offered additional miles of great sightseeing. The open prairie now presented low canyons of cottonwood trees and ash. In one of these more protected canyons was the Preserve Headquarters. As we pulled into the gravel parking lot an elegant looking eight-point buck darted in front of us and disappeared behind a building. At the headquarters was an enthusiastic and knowledgeable docent who was a treasure trove of information. 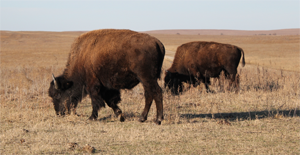 One item she mentioned was that the hunting of bison in the 1800s had been so intense that the last wild bison seen in Osage County was in 1869. 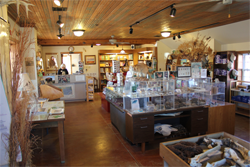 The Preserve Headquarters offers a great visitors center. One memorable exhibit showed just how tall the grasses at the tallgrass prairie can grow – as tall as a grown man. 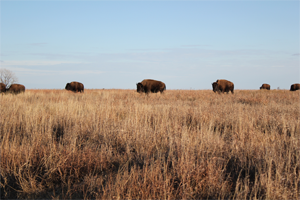 The grasses on the tallgrass are very nutritious and part of an amazingly fertile ecosystem. 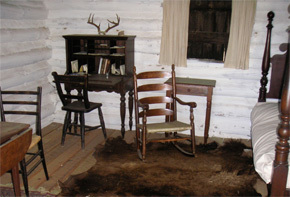 Another item was a table filled with bison bones and fur. I had expected the fur to be harsh feeling but, it was surprisingly soft and extremely warm. A scapula (shoulder blade) was at least 21 inches in length and 14 inches wide – a big bone for a large animal. Near the headquarters are several short walking trails that looked welcoming, but the temperature that day was lowering and the wind was picking up. We left the preserve when the sun was very low on the horizon. As the sun lowered past the rolling hills the dark forms of the bison were silhouetted against the rich shades of an ever increasingly dark sky. 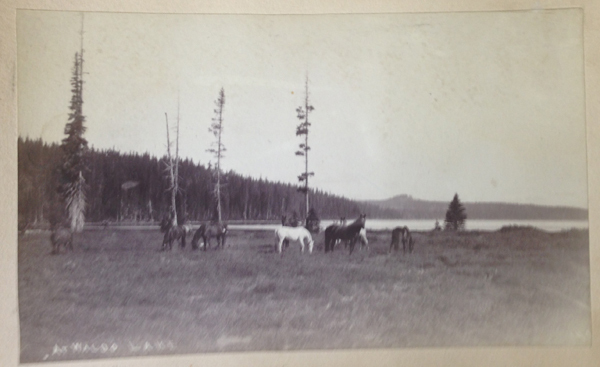 My heart pumped a little faster and my breathing quickened – it was a scene of the American West. If you are interested in visiting, make the most of your day, stay overnight in the town on Pawhuska so you can get an early start. There are no gas stations or places to eat on the preserve, so fill up your gas tank in town and take some lunch or munchies with you. Tulsa, Oklahoma, has an airport, but be prepared for a good hour-and-a-half drive just to get to the preserve. Entering the preserve is free, though recommended donations of several dollars per person are welcome at the headquarters. I was informed by a docent who has been at the preserve for years the best time to visit is in the spring (May) when the wildflowers carpet the landscape and the colors are superb. I plan to return at that time. The Achensee (ah-khen-say) is a beautiful natural lake nestled in the mountains of Tirol, Austria. 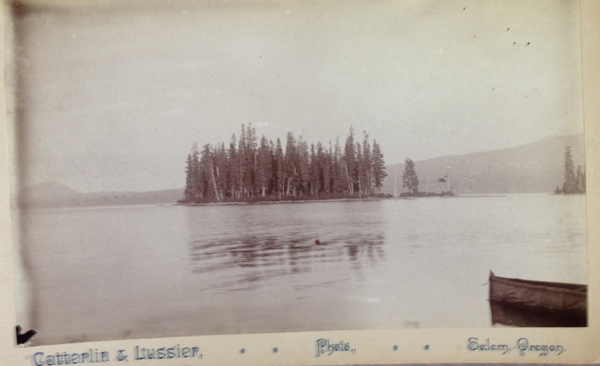 The lake is sizable being 1 km wide and 9.5 km in length. It was to this lake that we traveled for a day trip. The Austrian countryside sped past our window as the modern, aerodynamic train shot down rails of seamless steel. After a quiet, thirty minutes ride from Innsbruck, we departed at the Jenbach Bahnhof (Jenbach Train station) and proceeded only a few steps to the waiting Achenseebahn (Achensee train). Here stood a mechanized anachronism; an old-time, coal-burning, steam engine. 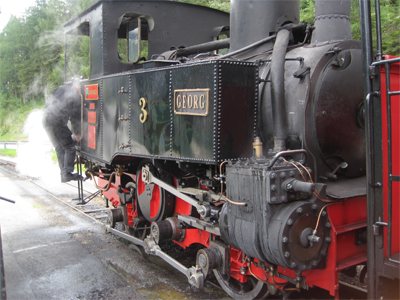 It traveled on a narrow gauge rail, yet the engine was surprisingly large. The engine was oily, smelled of grease and belched and hissed steam. Inside the engineer’s cockpit, a messy pile of coal was sprawled across the metal floor. Along the sides of the machine were giant metallic wheels which supported the steam engine’s carriage. Underneath and between the wheels was a giant gear – a third rail – this was used by the train for traversing steep gradients. We boarded one of two open-sided passenger cars. An antiquated latch locked a mini-door and kept several of us pinned in our row. A plaque on the wall stated the car was built in 1889 for Kaiser und König (Emperor and King). The steam engine’s whistle was activated and a long high-pitched wail announced the start of the journey, with a small chug the behemoth came to life. The chugs grew with intensity and the entire train lurched forward as the engine pushed the cars uphill. Just one minute into the trip the tracks became steep and the third rail was activated, a clank-clank-clank of the greased metal gear could be heard. Geysers of dark smoke belched from the engine’s stack, the plumes repeated faster and faster as the machine’s power came to full strength. An engineer or an assistant shoveled coal into the engine’s furnace to feed the fiery beast. The burning coal boiled water and produced steam, this in-turn powered gears that moved the locomotive ever further up the hill. The cars were pushed by the engine about as fast as a person could jog; through forests, past houses, small villages, and fields. Cars would stop at crossing signals and patiently wait for the train to pass, the people inside the autos were smiling just from seeing this historic train. On occasion tourists would run to a fence and start snapping photos, people in the train would wave back. The engineer would blast the whistle to add some zest to the excitement. Sitting in the passenger car with my arm on the railing, I noticed my outside arm was suddenly covered in ash! The great billow of dark smoke had risen over the cars and the heavier ash particles were softly raining down. After the train crossed the highest point the engine was detached from the cars, it then traveled on a parallel track to the front of the train and was re-attached. Now the engine pulled the train. We resumed our trip. After a few minutes the track curved and in the distance was a sheet of blue hidden among the trees – this was the Achensee, a great inland lake, the largest in Austria. 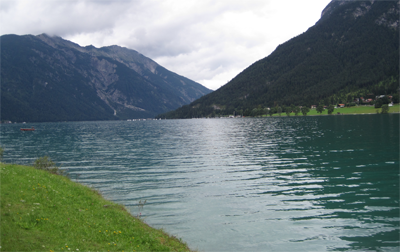 The lake rested in a deeply carved valley surrounded by high Alpine mountains. 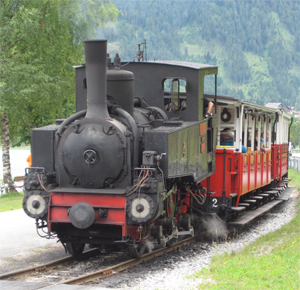 A jet of steam was released from the side of the engine as the train stopped just meters away from the lake, we had arrived at the Achensee. The engineer jumped out and pulled a large faucet arm over to the engine and released a great flow of water. The steam engine greedily guzzled water to replenish itself for the return trip – a trip this steam engine had made thousands of times over the past hundred years. 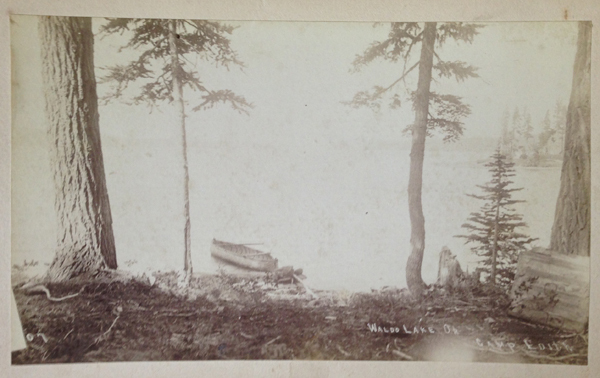 The lake was beautiful, and because it was easy accessibility by automobiles and buses, the lake was a tourist haven, especially along the southern and western shore of the lake where we had arrived. We walked on a lakeside trail for about 5 kilometers before we finally passed the last of the restaurants, tour buses and a multitude of visitors. It seemed odd that so many folks who visited these areas of comfort and relaxation looked unhappy and solemn from behind their sunglasses and wide-brimmed sun hats. The trail we were on followed the edge of this elegant lake. Once we were past the touristy area the paved pathway narrowed, then became gravel walkway, then smaller again to become a dirt footpath. The lake began to reveal itself as we walked and passed small springs and quiet pebbled beaches. At one point a waterfall burst over the edge of a precipice – from fifty feet above – and tumbled down upon the path. The force of the water was strong but this part of the trail was shielded by a tin-roofed structure that looked all the worse for wear. The falling liquid drummed loudly on the roof as we passed under it. 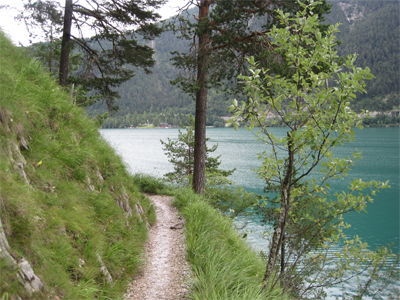 The trail meandered along the inlets and indented shoreline of the lake. At one point we passed a great disgorgement of stone that had slid off the mountain – the action had created a jumble of rocks that fanned into the lake – we stood at the tip of a giant landslide. The mountain above was scarred like a great wound had been inflicted upon the surface. We had been walking for two and a half hours since we left the train and were hungry. The plan was to meet several family members at an Alm about halfway up the northwestern side of the lake. They would arrive by ferry. We met them at the Alm and ate lunch, though, afterward we wished we had not eaten, for the meal was industrial in its preparation and it was presented without emotion. The meal was a disservice both in flavor and price paid -it did not represent this beautiful area. Having said that I must add that as I left the restaurant we passed others wolfing down the same meal, they were raving about how good it tasted. We went outside and waited for the ferry. Our return trip would be by boat rather than by shoreline. A large ferry boat out on the lake blurted its horn. It approached and with surprising agility maneuvered up to a small dock; we boarded. Not many people were on the ferry and we had the ship mostly to ourselves. Placards inside the main cabin advertised a nighttime cruise, an attached photo showed a sparkling and illuminated vessel on a dark body of water with a setting sun over a backdrop of mountains. The ship hugged the shoreline. Now, just offshore I could study the topography of the steep and rugged mountains; from the sharp angle of the land entering the lake, it was obvious our ship traversed over deep waters. Looking overboard and into the lake’s water, the late afternoon sun shot lances of light down into the depths. The visibility was about 9m (27 feet) or so. The recently eaten lunch sat in my tummy like a brick and I thought that if the vessel was struck by a calamity and sank into the dark waters of the Achensee that I would sink with it, like a stone, all because of that unfortunate meal that weighed so heavily on my stomach. Within twenty minutes the vessel covered the same distance that I had walked in about 2 and a half hours on the shoreline. It was then I realized I had not been so far away from the touristy area as I perceived myself to be, in fact, I had been in the middle of it. We docked near some hotels to gather passengers and the same solemn looking tourists I had seen earlier boarded. I guess they had eaten some terrible food too and that unhappy experience had etched itself on their faces. In another fifteen minutes, the ship docked again and we disembarked. 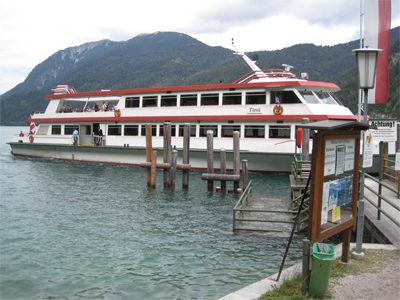 The Achenseebahn was quietly puffing away, waiting for us and others to board and be returned down the mountain. The engine growled to life and we enjoyed a pleasant journey back to the train station. Everyone was tired and some of the people on the train slept, which was surprising considering the noise from the engine. The late afternoon light provided great opportunities for photos as the train descended into the Inn Valley. In the distance, the train station and our final stop. Ten minutes later a modern, electric powered train arrived at the adjoining station and transported us back to Innsbruck in comfort. While in Innsbruck, Austria, I observed the one-hundred-year-old building I was staying in was similar in architecture, but obviously much older than the surrounding buildings. I asked some local residents about it. They were not sure, but the question intrigued them. Finally, a call was made to Opa (the Grandfather) of one of the residents. He had lived in the building as a child. He said the nearby rail yard in Innsbruck was destroyed by Allied bombs during the War (World War II) and many of the surrounding buildings had been pulverized, but his building survived – he was age 4 when the war ended. For many years afterwards, he could remember having a clear line of sight, all the way to Schloss Ambras castle, several kilometers away. In the late 1940s and early 1950’s, the ruble was removed and the city rebuilt. Wow! A simple question had uncovered a great story. My curiosity had peaked, but where could I find other hidden stories? The next day I made a trip to the Stadtarchiv Museum (City Archive Museum) located in the Altstadt (Old Town) part of Innsbruck. The museum has two entrances, but the front entrance from Altstadt is the most alluring. Peering in from Altstadt via a tunnel you see a pleasant courtyard. Most tourists see the courtyard and just move on, but if you take the time to explore, a small cobbled alley – almost hidden from sight – reveals itself. The museum entrance is just ahead. The museum itself is small and consists of two halls. The first hall chronicles the history of Innsbruck from the initial founding roughly eight-hundred years earlier to the 1800s. It also includes many stories about the cultural and economic contributions of the city. Take some time to enjoy the beautiful paintings of Innsbruck at different times throughout the centuries. The second hall includes an exhibit about the time between the wars when Tirol was annexed by the Nazis. It and also features photos of the liberation by the Allied forces. One picture provided a direct connection for me; it is a black and white snapshot of an American soldier standing in the middle of a street directing traffic – it was the same location I had walked across that morning coming to the museum. I saw a map of the bombs that had been dropped on Innsbruck during the War. The area around the building where I was staying was in was a sea of red dots, indicating where the various incendiaries had detonated. For some reason, possibly luck, the building survived while others around it had been devastated. The exhibit then moves from that ugly period in history and continues to the more aspiring time when Innsbruck hosted several winter Olympic games. The displays in the museum are in German, but translations of the displays are available in a booklet printed in English. This tiny museum is one of the most fascinating in all of Innsbruck, yet possibly one of the least visited or even the least known. 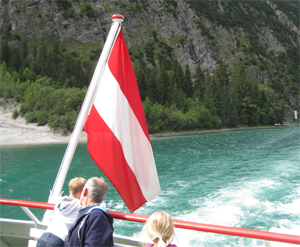 It is best enjoyed once you have seen many of the other sights, traveled around and obtained a ‘feel’ for Innsbruck. 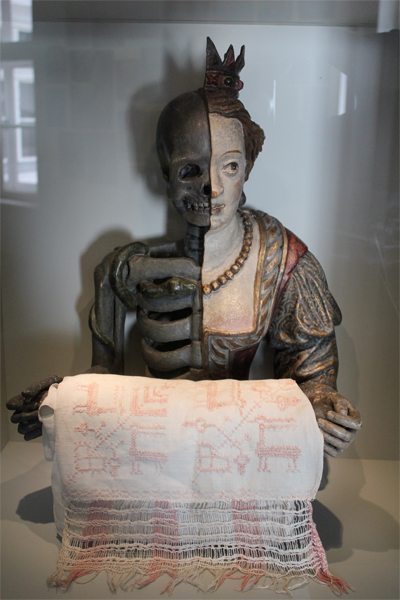 Only then will some of the hidden stories written within the museum make themselves known. 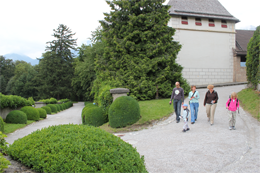 An enjoyable outing while visiting Innsbruck, Austria, is Schloss Ambras. Schloss in German means castle. Plan to spend at least half a day to explore the armory, the chamber of curiosities, the gardens and the many rooms of this Renaissance palace. The castle houses a splendid collection of historical items and artifacts that have been collected over the centuries. The first stop is the armory. 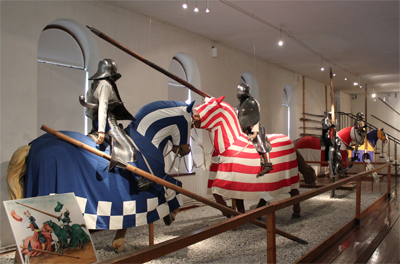 Here visitors are greeted by a life-sized exhibit of armor-clad knights on horseback. The craftsmanship of the armor is first-rate. The metal work is so shiny that at times a visitor can be momentarily blinded by the reflecting lights. Adjacent rooms have a weaponry-cornucopia of swords, pikes, lances and a variety of hunting blades, even some of the earliest rifles. The Chamber of Arts and Curiosities lives up to the name. 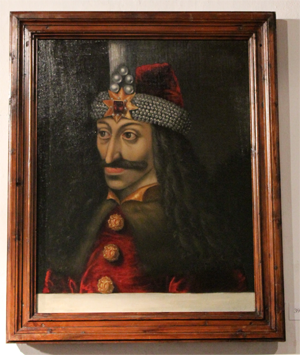 Some of the items in the collection do not need an introduction, like a painting of Vlad the Impaler, who was notoriously known throughout the centuries as inflicting horrific, slow and grotesque deaths upon his enemies. His atrocities have sobered many throughout the years, causing a person to wonder if such a human was really a monster? Vlad was the inspiration for the character we know today as Dracula. Another painting features a man who survived being impaled in the head at a jousting tournament and apparently survived well enough and long enough for his portrait to be painted. 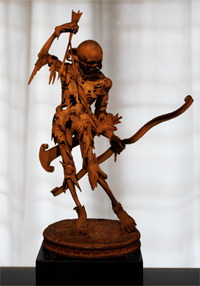 The collection includes hundreds of items, but one tiny wooden sculpture, called the Tödlein, less than foot tall, is so ornately carved with such precision and detail that one catches their breath – only then to see the carving is without facial features – a skeletal head with deep and empty eye sockets and the toothy face of Death – and one catches their breath again. Walking across the green courtyard in the brilliant sunlight you pass a small cafe and walk to the upper castle. Here is the Elegant Spanish Hall. This beautiful hall was built between 150 and 1572 and is truly a feast for the eyes. As in years before people have donned their finest attire to attend waltzes, balls, and social events and visit this hall for an evening of revelry and fun. Today, waltzes and other events continue held here in this lovely hall. The remainder of the main castle offers 4 floors to explore. 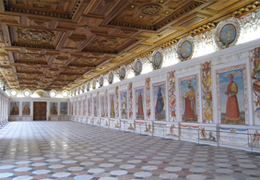 On these floors are 250 paintings from over 400 years of members from the House of Hapsburg and relations. You can also find special traveling exhibits. There is also a small, but the ornate church, and a bath hall. Finish up the visit by exploring the lush grounds that surround the castle. Ever wonder how those gigantic bells at the tops of cathedrals and town halls in Europe are made? 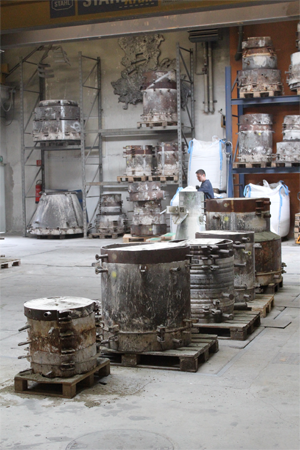 A visit to the Bell Museum and Grassmayr Bell Foundry in the middle of Innsbruck, Austria, can help to answer that question. For over 400 years bells have been forged at this small business. Visitors can explore the bell museum to learn about the manufacturing process, tour the old foundry and get a peek into the modern facility that continues to make bells. This is not a large museum, but a good amount of information and history is packed inside. A ten-minute video plays continuously in a small room. It chronicles the birth of a bell from ore, through being produced, to completion. The video is in German, but English only speakers will still learn a good deal. Two items from the video are of particular interest: with all of the wars in Europe over the centuries few enterprises survived, however this bell foundry continued by producing cannons; the video also states that records were kept of all the bells that were made (over 6,000) but no records were kept of the number of cannons produced. In the museum are bell patterns and casts of all sizes. 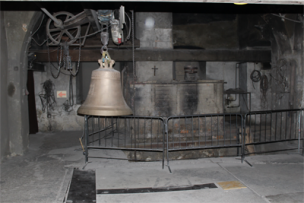 Markings on the floor show sizes of some of the large bells – some of which are several meters in diameter! Outside is a courtyard lined with bells where you can see just how big and sturdy some of these amazing bells are up close. Many visitors to Innsbruck see just the major sights and miss some of the real gems. 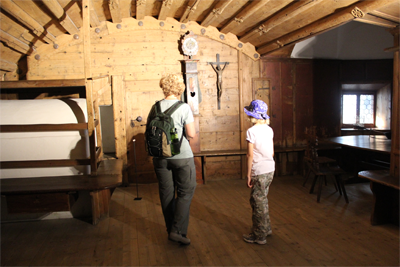 One gem is the quiet Tiroler Volkskunstmuseum (Tirolean Folk Museum), it helps to tell the story of the Tirolean people who live in this dynamic landscape of high mountains and cultivated valleys. The museum has amassed a collection of cultural treasures: richly decorated traditional costumes, beautifully carved wooden household utensils, to religious objects that celebrate life, recognize the rhythm of seasons and some items that reflect on the uncertainties – or even some unpleasant questions about life itself. One section of the museum I enjoyed focused on the Tirolean common rooms, or Stube (pronounced st-oo-beh); these rooms are made of wood and ornately carved from floor to ceiling. It was in this common room where every member of the family gathered to eat, keep warm, worship and share stories. Long benches along the walls provided seating for multiple family members and friends at the tables. Visitors to the museum can explore many of these rooms and walk between the different styles and architecture. The rooms also included a large ceramic tiled wood stove, called a Kachelofen (pronounced kah-kel-ow-fen). Some of the Kachelofen were ornately decorated and beautiful, others had more earthy tones, but all looked like they would keep a house very warm and comfortable. Many modern houses in the Tirol have a Stube with many of these elements built into them: an abundance of wood, furniture pieces that are ornately carved, long benches that seat multiple people, or possibly an ‘L-shaped’ bench built into the wall, and in the corner or somewhere on the wall is a wooden cross. The Kachelofen also continues in some houses, but in more modern forms. Another item of interest at the museum are the traditional costumes. Each valley in the Tirol has its own style of traditional costumes for holidays and events. 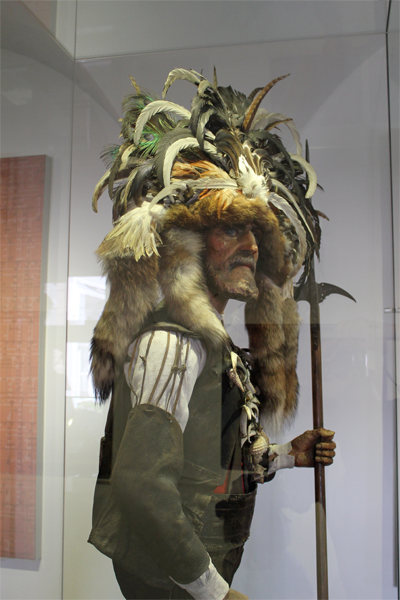 One of the more ornate costumes I saw originated from Südtirol (South Tirol) near the town of Meran, here a bearded man is adorned with bird plumes and furs. The museum offers visitors a chance to see the adjacent Hofkirche from the unique perspective of looking down upon the dark bronze statues and the crypt of Maximilian I. Ask at the desk where the door is located so you don’t miss it. I found the museum-bound together much of what I was experiencing by visiting the people here; it provided greater depth and history to the modern culture. That personal connection is the real treasure. The Tiroler Volkskunstmuseum is near the sights of the majestic Hofburg, the Hofgarten and Altstadt (Old Town). Inside a Stube. Note the Kachelofen at the left, on top is bed space. A Towel Rack. This appears to be carved from wood. One of the more creepy items on display. It is included in a section in the museum that reflects on the uncertainties – or even some unpleasant questions about life itself. One of the more ornate costumes I saw originated from Südtirol (South Tirol) near the town of Meran, here a bearded man is adorned with bird plumes and furs. A visitor to Innsbruck, in the middle of the Tirolean Alps of Austria, would not immediately think this is a great location for a zoo, but a great zoo does exist. The Alpenzoo, as it is called, is unique in that the zoo focuses solely on the animals that inhabit the Alps. Visitors can see a variety of Alpine creatures including Moose, Lynx, Golden Eagle, Ibex, Brown Bear, European Bison, European Otters, and Wolves. The zoo accommodates about 3000 animals in all, many of the smaller critters like fish, birds, reptiles, and amphibians. The zoo does an excellent job introducing visitors to the many animals that inhabit this beautiful region of high peaks, deep gorges, rolling hills, and cultivated valleys. During my visit, while near the Wolf enclosure, the resting pack of wolves suddenly sprang to life and moved with all speed to the lower area of the exhibit. I moved to the same area and found a docent near a door, behind her was a small group of children and their parents. The docent gave the children some instructions and opened the door. The wolves were present and looked at the docent with anticipation – they were only two meters (6 feet) away and at almost the same level as the people. Only some electric wires separated the space. The docent opened a bag and pulled out some large chunks of red meat. After tossing in a few initial chunks she invited the children to have their turn feeding the wolves. The kids had a blast. Viewing the bear was another treat. An underground viewing area allowed visitors to be up close and look through a large window onto the bear’s enclosure. I found that when most of the other people left you could snap some amazing pictures – provided the bear allowed you to have the pictures. One of mine is shown above. The Alpenzoo can be reached from downtown Innsbruck by bus, car, a local tram known as the Hungerburgbahn, or even by walking. For a wonderful sightseeing experience walk along the river Inn and up the hill to the zoo. A quick web search revealed wartime era airplanes were at a local airstrip and they could be toured. This was a golden opportunity to introduce my young daughter to a part of history. We arrived on the tarmac and saw three planes: single prop TP-51C Mustang called “Betty Jane” and two large bombers. Betty Jane was silver in color with a sleek design; she was tightly built for speed and highly polished so that sunlight gleaned of her exterior occasionally blinding those who dare to look upon her. Some partition tape kept onlookers several steps back; this was a ‘look but don’t touch’ aircraft. 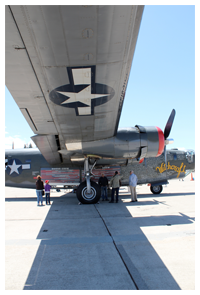 The B-24J Liberator sat further afield. This aircraft was stoutly and solid in appearance and looked as though it could take some solid punches if needed – it could also hit back with its 10 .50 caliber machine guns. It was a good-sized plane with 67 feet in length and a wingspan of 110 feet. Visitors could climb/walk through the plane via a small entrance at the rear. Inside it was Spartan with exposed cables and ribs of the airplane showing. Continuing through the plane was a large bay filled with replica bombs the girth of watermelons and about three feet long. A skinny catwalk in the middle of the bay, about six inches wide, was the only walkway to the other side. This was not scary when walking several feet off the ground, but what about when you’re several thousand feet up in the air? At the other side was the cockpit, with a variety of levers and switches. The Liberator could carry up to 28,500 pounds of weaponry – that is equivalent to the weight of 7 modern cars each weighing 4,000 pounds each! 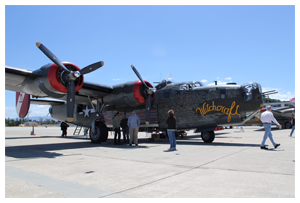 The Liberator is the only restored flying B-24J in the world. 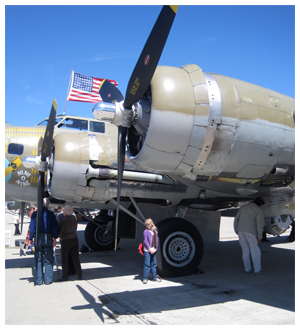 The next plane we visited was the elegant and formidable looking B-17G Flying Fortress. This is aircraft is often featured in movies and what people frequently think of when they hear of a Word War II bomber. Although this plane is somewhat pleasant to view it should be remembered it is a machine of war with 13 .50 caliber machine guns. 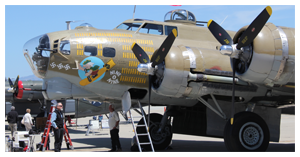 The Flying Fortress is about 75 feet in length with a wingspan of 104 feet; this workhorse could carry up to 35,865 pounds of weaponry – that is almost equivalent to the weight of 9 modern cars each weighing 4,000 pounds each! Visitors climb in through a ladder at the front of the plane. You can see in the front gunner’s position and also the compact looking cockpit. Like its sister plane, the inside is cramped and utilitarian – space was not wasted on conveniences. A small catwalk leads people through the bomb bay and you have to steady yourself with a rope handrail. Here you can see the ball-shaped lower gunner’s turret and get a feeling for just how small, claustrophobic and even terrifying this position must have been. 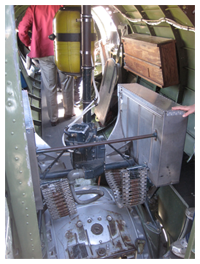 Next were the side gunner’s stations and their large .50 caliber machine guns complete with replica bandoliers, filled with bullets the size of lipstick containers, that fed into the movable (but non-functioning) machine guns. At one point a mechanic pulled off the cowlings over an engine and completed some work on an engine. He was readying the plane for a flight that afternoon for visitors. We toured the planes several more times, walked around and underneath them and thoroughly enjoyed the visit. Later that day, while at home, I again heard multiple propellers with a deep sounding and powerful “WWWwwrrrrhh” overhead. Directly overhead was the Flying Fortress that I had seen earlier that day. It really was something special. I am glad I had the opportunity to see it and introduce a family member to this part of history. These aircraft have been recovered and restored by the Collings Foundation, a group that preserves machines that helped build the world and helped keep it free. Visitors can tour the planes on the ground and experience them while in flight. Check the foundation’s website for tour locations, dates and prices. 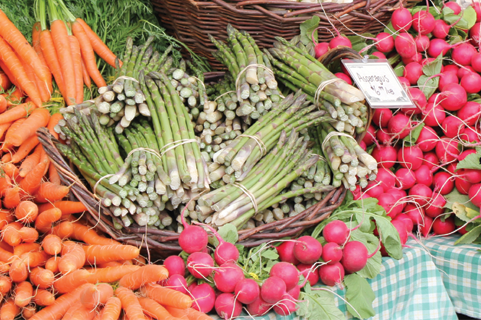 The market has a long history of providing jobs and locally produced food for the community. During a springtime road trip through Oregon’s Willamette Valley, I was offered a delicious opportunity to experience local and farm fresh food while visiting Eugene. Over the years of traveling in Oregon I had always found myself returning to the Eugene area, yet once again I was finding my time limited. I decided to make the best of those few hours and visit the local farmers market. It was a Saturday morning and I walked about 15 minutes from my motel to the corners of 8th and Oak Streets. The evening before there had been a gentle rain giving the sidewalk and surrounding buildings a pristine sheen. The air was cool and moist but there was gentle warmth that hinted summer was near. Ahead was a bustle of activity; there was a small city of tents, cars were being unloaded, people were milling about, and I could hear the music. A woman passed me; she was carrying a large cotton bag that had been stuffed with greens, the vegetables were so abundant they appeared to be surging over the bag’s edge. I had arrived at the downtown Farmer’s Market, officially known as the Lane County Farmers Market. As I walked up to the first grouping of booths I could not deny the abundance of colors: a color pallet of orange from the carrots, a gradient of white to green from the asparagus, and the rosy red blush of turnips. Nearby was a grouping of dark leaves that sprawled across several displays, each bunch was vibrant and sturdy – it was a small forest of salad. A man passed by, he carried a flat filled with produce and presented it to a woman behind their display. The farmers were surprisingly healthy looking with pink cheeks, and well-defined statures. Mostly, though I noticed their smiles; it was obvious they loved their work. The time was now mid-morning and the market was just starting to kick into a higher gear. Everyone was lively and embraced the good ‘vibes’ of the morning air. A dark-haired girl gently swayed her head to the melody she crafted with her violin. The open case at her feet welcomed donations from her milling audience. There was a table covered with a red checkerboard cloth, upon it was a small display of eggs, each egg had a slight, yet distinct variation from the next; some were tan, others were red, some were speckled. As I observed them a woman wearing a sun hat came up, plunked down her money and spoke to the owner by name, she wanted 2 cartons. The scene reminded me of a cowboy swaggering up to the bar of an old saloon. The owner reached into one of the coolers, that was behind the table, and gave the woman 2 dozen fresh eggs. A wood-fired pizza oven gently puffed a thin trail of smoke into the sky; it was still being warmed in preparation for lunch. A waft of aromatic goodness and a sizzle from an iron skillet was seductively compelling. I peered over splashguard of a booth’s display; a man had just added several types of veggies and garlic to a masterful looking egg creation. It appeared as though this dish could rival a similar meal from a high-end restaurant. Finally, my eyes and tummy got the better of me. I had to sample some of this amazing food, but I was in a quandary, of the amazing choices what should I eat? Finally, I decided, and then I ate well. Afterward, I stepped through a well-worn door and into the red-bricked and cozy Park St. Café; one of the neighboring locally owned businesses. I enjoyed a delicious cup of coffee, read the paper, and watched the market unfold until it was time for me to return to my motel and grab my bags. For several minutes I had noticed a family outside the window, a curious child was at their side, the parent’s were carrying bags full of bread and vegetables. They appeared to be waiting for someone. I tipped the cup and savored the last few rich drops, both of coffee and of my time at the market. The family started to smile and they welcomed some friends who had just arrived, giving warm hugs to each other. As I sat the cup down, it was decided. This was a place where I wanted to spend my time. The market has a long history of providing jobs, and locally produced food for the community; but look deeper, it’s the embodiment of a connection to the land, to friends, and with neighbors. National Parks represent many things – including the best of America. When families visit a gift store in a National Park they expect products that are well-made, durable and above all, safe. Sadly, some products at park gift stores do not represent the best of America. Like other places where you shop you need to be aware of what you are buying. Here are several tips to help the savvy customer when visiting a National Park gift store. The savvy customer should know about product labels. Product labels are important because it tells you critical information about the product you will be buying – or what you will be buying for your child. Parks are family destinations; park gift stores should sell products that are made to safety standards that protect children. For example, consider a Junior Ranger backpack. Backpacks, parks and kids go together, but are all Junior Ranger backpacks sold in park stores safe for kids? Just because it is sold in a park gift store does not mean it is safe, or a well-made product. What information would a savvy parent look for? First, look for a hangtag. If you do not see a hangtag be very concerned. Let this absence of information be a big flag that waves a ‘be cautious’ warning in your mind. Such an absence means the park’s gift store does not have your best interest or safety in mind. In what country was it made? What materials is it made from? Is there a web address to learn more about the product? If a product states “Made exclusively for” and does not list the above information be concerned. Third, look for a permanent label. Permanent labels are sewn inside backpacks and state who made it, where it was made, provide a unique identifier, and a web address or similar so customers can reach the manufacturer. Providing such a label is more than just identifying these key pieces of information, it is also the law. An Act called the Consumer Product Safety Improvement Act (CPSIA) requires that products “designed or intended primarily for children 12 years of age or younger” must meet certain rules for product safety including: acceptable levels of heavy metals like Lead, toxic chemicals as well as proper labeling to inform consumers about what they are buying. A permanent label is required in case of a recall and to help parents identify the product if it is determined to be unsafe. Both manufacturers and importers must comply with the Act for all products. As a savvy parent look for a permanent label as it demonstrates the manufacturer shows a higher degree of professionalism in their work. Obviously a hangtag or permanent label might not be feasible or reasonable for some products; a book does not need a hangtag, but it still has information inside the first pages about who published the book, who is the author, and where it was made. Every product should have supporting information so customers can learn about it, but most importantly, help them identify who is responsible. Any product that does not include such information should never be bought by the park’s gift store in the first place and should never be offered for sale. Sadly there are products, including Junior Ranger backpacks, being sold in National Park stores that omit or ignore the most basic product information as required by the CPSIA. The savvy park gift store customer will seek out products that offer transparency and good faith. Was this product made not using sweatshop labor? Was this product made with materials that are safe? Will this be safe for my child? Does the vendor publicly say who tests their products for Lead, Phthalates or other chemicals? Does the manufacturer follow any international standards like the ISO-9000 quality management standards, or the SA-8000 standards for minimizing sweatshop labor? What about other standards? Does the manufacturer have any third-party green business certifications? Does the manufacturer use a third-party forensics lab to test their products and do they post the results online? If a manufacturer makes everything under the sun at low prices, but cannot document any of it, or state where it is made, or how – you should be concerned. It is the responsibility of any manufacturer to, in good faith, continually work to improve their products so they are safer. As an example, I had a conversation several years ago with a vendor who made textile products and sold them directly to park gift stores. We were both exhibiting at the same national conference that park store buyers frequent. This vendor roughly stated their textiles did not need to list country of origin or list what materials it was made from because the Federal Trade Commission excluded this particular item from the Textile Fiber Products Identification Act. Regardless if this was legal or not, such a reason demonstrates a lack of good faith (honest intentions). At the show the vendor sold a lot; because he hid behind the law he could keep costs low. Unfortunately, many park store buyers just saw a low price point and did not look at how transparent the vendor was or if he was operating in good faith. Sadly, there continues to be a myriad of products (mostly promotional items that are sold at low costs and made overseas with questionable labor) that continue to be sold at park gift stores. Many of these promotional items cannot demonstrate or communicate they have transparency or good faith intentions. If you know of an unsafe product report it to the Consumer Product Safety Commission at this website. Until all park stores walk-their-talk it is up to you, the customer, to be informed, to ask basic questions, to demand and be willing to pay for safe well-made products. National Park gift stores have hard-working people who want to represent the best of America. Sadly, some decision makers do not represent the best of America and allow for bad or unsafe products in these stores. Be a savvy customer and look for product labels, transparent business practices, and good faith actions. Be informed about product safety laws, report products that are unsafe, and most importantly, ask questions. 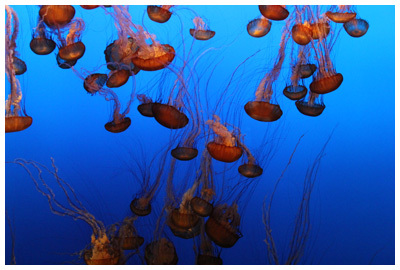 A visit to the Monterey Bay Aquarium in California can be a treat. Families will enjoy the many treasures of the ocean with exhibits that inspire, educate and astound. Whether it is the 28-foot high kelp forest exhibit, the touch pools, mesmerizing jellyfish (shown) or seeing the ever-favorite sea otters it is a wonderful place for kids of all ages. Summer is the ‘high’ season, but if you can visit during downtime you might have the aquarium mostly to yourself. Consider visiting during October; the weather is generally pleasant, and most tourists are focused on the upcoming Christmas Holidays. Another good time is during the winter season when most families are reluctant to get outside. If summer is the only season you can visit the aquarium consider some crowd management techniques and visit mid-week or early/late in the day. Weekends are very busy, but Tuesdays and Wednesdays generally have fewer visitors to the aquarium. A staff member suggested that Wednesday was the best day to visit any time of year, but in the summer Wednesdays can still be busy. 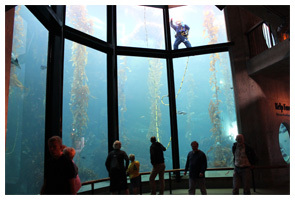 The photo shows a diver cleaning the glass in the impressive Kelp Forest exhibit with a handful of onlookers silhouetted in the foreground. When you visit during downtime you can better appreciate all of the exhibits without the crowds. Regardless of the time of year avoid the bulk of crowds by visiting in the morning for an hour just after the aquarium opens then return later that afternoon several hours before it closes. You can always stamp your hand as you leave the aquarium to return later that day. 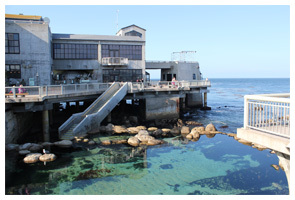 A good number of people who visit the aquarium just explore a small area in Monterey called Cannery Row. Make it a point to see some of the sights in Monterey and the neighboring Pacific Grove. Better yet, just go for a nice walk. A pleasant and visually delicious walk along the Monterey Coastal Trail takes you from the aquarium to Pacific Grove – priceless views without the expense. Avoid the shock of arriving in Monterey only to learn that parking will cost you at least $10 to $15 a day. Driving around trying to find a cheaper space in the area is often not practical, frequently wastes time and on busy traffic, days will lead to stress. Once you find a spot, grab it and start your day – having the family time is more valuable than grumbling about paying for parking. If you park on the street at a meter bring a roll of quarters (or two). Several local garages and parking lots are located near the aquarium but these can fill up by 10 a.m. on busy days. Parking in Monterey can be expensive so plan for it. Bring some munchies to stave off that mid-morning or afternoon hunger. When you are ready to eat the aquarium has a café/restaurant and the surrounding area offers a number of places to eat. I have never been disappointed eating at the Sea Harvest. It has good food at reasonable prices. The Sea Harvest is located opposite the city’s public parking garage by the exit, just look for the big bluefish on their sign. 598 Foam Street, Monterey. It is easy for a family of 3 to drop $75 just to enter the aquarium. The money is well spent as the aquarium is a world-class experience. If you are staying in the area for several days or will visit on several occasions, consider a family membership. The membership pays for itself in two visits and you have the benefit of entering the aquarium at a side entrance to avoid lines. Plus you receive a 10% discount at the aquarium’s gift store. If you are staying overnight consider staying in nearby Pacific Grove about a mile and a half from the aquarium. It has some nice places to stay, like the Bide-A-Wee Inn and Cottages. Look for places that offer rooms with a small kitchenette and breakfast in the morning. The small downtown area of Pacific Grove has cozy cafes and a coffee shop where you can relax on a couch and enjoy a good book. During the summer and over major holidays lodging prices in the Monterey area can double or triple from their off-season rates so plan ahead and look online for deals. If you are really budget minded try the Monterey Hostel only several blocks from the aquarium. Reservations are recommended at the hostel any time of year. At the southern end of Monterey Bay in California is the picturesque Point Pinos Lighthouse. Since 1855 it has helped those at sea find their way. 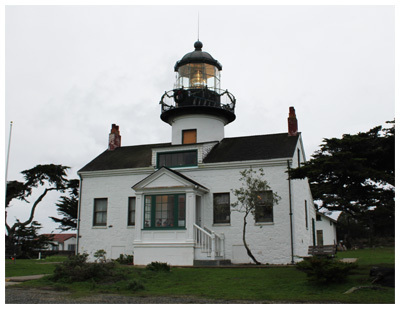 Families are welcome to explore Point Pinos, the oldest continuously operating lighthouse on the west coast. The lighthouse consists of a small, two-story house. Rising above the roof is the multi-prism Fresnel lens (pronounced fray-nell) that projects the light many miles out to sea. Unlike many lighthouses that sit at the water’s edge, Point Pinos is located a several minutes walk inland. During my family’s visit we rounded the front of the building and were reminded of the rainstorm that was approaching from the Pacific Ocean. A strong and cool wind was blowing and dots of horizontal rain patched our clothes. A man with a white beard welcomed all of us into the warm and cozy building. He was a volunteer docent, but was dressed as though working at a lighthouse was his profession. He could easily have walked out of the late 1800’s. As he closed the door the blustery outside wind immediately ceased. The house was noticeably solid and well built. The walls were roughly a foot thick and had been constructed with a granite core; the building’s outside had been covered with wood and was whitewashed. The main floor included three rooms and an old-time bathroom with a gravity feed water closet. A living room was refurnished with furniture and décor. Moving to the second level we ascended a steep spiraling staircase. 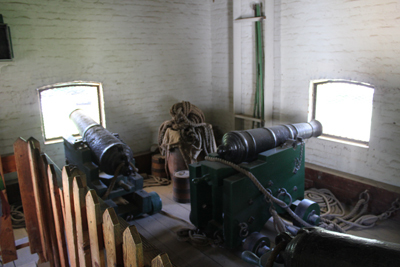 Here were two rooms: first was a refurbished bedroom of the lightkeeper, the second bedroom offered a glimpse into the history of the area during World War II when soldiers were stationed here to help protect the coast from possible enemy attacks. A visit to the third level, with the Fresnel lens, was unfortunately off limits to visitors and we could only peek up the spiraling stairs … very curious about the lens we could not see. Returning to the main floor we explored some side stairs that led to the basement. The basement was made with the same rock as the house; it was obvious this entire building was stoutly constructed and looked as though this place would survive any calamity. As we stepped into this cozy underground space another docent greeted us as. She was very eager to share her knowledge and gladly answered our questions. A well-machined series of gears, levers and weights sat inside a Plexiglas display. This curious looking machine was an original ‘clockworks’ timing mechanism that allowed a shade to move around the light, giving the light a characteristic ‘light signature.’ The docent picked up a large wrench, inserted it into the machine and gave it a good turn. Immediately the weight raised and the gears began to rotate. Above the machinery a large polished metal shield quietly turned briefly blocking the light from our view. A display about the Fresnel lens showed how the use of simple glass prisms can help a small light be seen very, very far away. 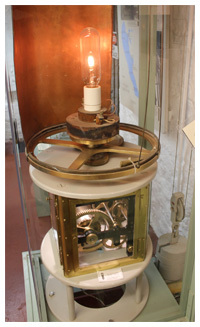 The light bulb used in the lighthouse is about the size of an adult’s thumb, yet the Fresnel lens allows this light to be seen 17 miles (27 km) out to sea! As we left the lighthouse the damp wind blowing off the Pacific greeted our faces. Looking across the ocean swells of 12 to 15 feet (12.6 -13.5 m) were rolling into the shore less than a quarter of a mile away. Even from this distance it was easy to see spray jumping into the sky as the waves pummeled the rocks. Dark clouds were on the horizon and a gray ribbon of rain was falling in the distance. If I had to be on a ship, I would want nothing more than to make it safely home – and would be comforted to see this beacon of light from the Point Pinos Lighthouse. The suggested donation is $2 per adult and $1 per child. Donations are for helping to repair the lighthouse. Just north of Tulsa is a great museum with the art of the American West and artifacts from the Americas. 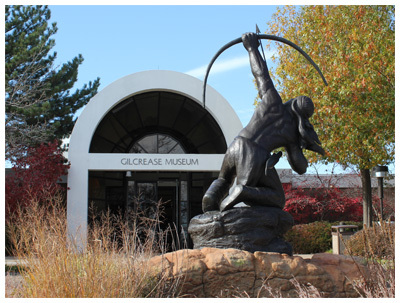 This is the Gilcrease Museum. It is a pleasant day trip for families curious about western U.S. history and the artistic traditions of Native Americans. During my visit, several favorite exhibits included: amazing paintings of ‘the West’, displays of Native American headdresses and clothing, and portraits of the men and women who helped shape the frontier. What really impressed everyone was the ‘Kravis Discovery Center’ on the lower level. This small research area houses many smaller items from the museum’s collection. Here are beautifully crafted arrowheads of all shapes and sizes – including some gorgeous and rare Clovis points, ancient pottery and ceremonial items. Afterward, grab a bite to eat at ‘The Restaurant at Gilcrease.’ Request to sit by the large glass windows for views of the picturesque Osage Hills. The menu offerings are simple, yet varied and very tasty. Parents will enjoy touring the various gardens that surround the museum. Kids can burn off some energy at nearby Stuart Park, just a quick walk away. Here you will find many carved woodland animals hidden along the trail. Visitors will also find a number of bronze statues on the museum’s grounds that are fun to visit. 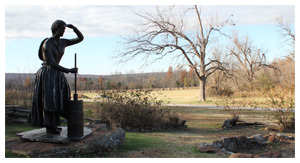 The image above, located at the entrance to the museum is the ‘Sacred Rain Arrow.’ The life-sized ‘Pioneer Woman’ sculpture can be discovered while exploring the nearby trails. The museum is open Tuesday through Sunday from 10 a.m. to 5 p.m. Closed on Mondays and Christmas Day. Admission is $8 for adults and kids under 18 are free. A short drive outside of Tulsa, Oklahoma is the 220-acre Redbud Valley Nature Preserve. This preserve has a great deal of scenery packed into a small space: woodlands, prairie grasses, a creek, springs, small caves, and rugged looking cliffs. Families will enjoy the main loop trail that takes about an hour and a half to complete. Kids will especially enjoy the many small caves and overhangs in the cliffs area. 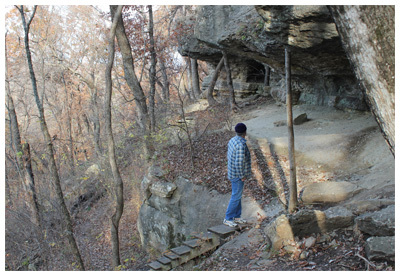 As your family explores look for what really makes this place special – many of the plants traditionally found further west on the prairie and much further east in the Ozark Mountains can be found here in this preserve. Think of Redbud Valley as a unique spot, between the prairie and the Ozarks, where these plants live. A small visitors center is onsite. Flush restroom facilities and picnic tables are located near the parking area. Admission is free. Redbud Valley is open from 8 am to 5 pm Wednesday through Sunday. From Tulsa drive east on Interstate 44 to the Hard Rock Casino on 193rd E (also known as Hwy 167). Go North on 167. Drive 2 miles to Redbud Drive, make a left. Drive roughly 5 miles until you reach the parking area. When people think of a log fort from the 1800’s they might envision a large square-shaped structure made with an outside wall of sharpened logs to keep out attackers. Watchtowers at the corners of the fort keep a lookout over ‘untamed’ lands. Inside the fort are soldiers cooking, cleaning, writing letters home and maintaining weapon readiness. In a modestly furnished room officers are engaged in negotiations with local peoples, trying to keep the peace while projecting American interests on the western frontier. 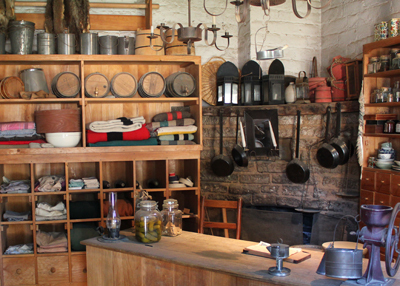 If you have ever wanted to explore such a place – you can at the Fort Gibson Historic Site in eastern Oklahoma. 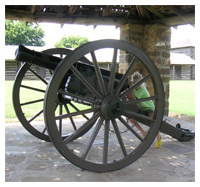 Fort Gibson is a great place to explore; kids will enjoy the cannon in the plaza while Mom and Dad can peek into various rooms and quarters that are refurbished with period furniture and equipment. During your visit check out many of the surrounding buildings in the area, many are from the 1840s -1870s. Fort Gibson is not known for one particular historical event like some forts in the west, rather it had a long service that affected many events in U.S. history. 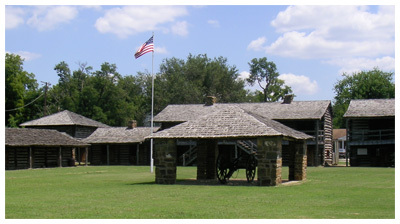 Some of the people who walked the grounds at Fort Gibson greatly influenced American history especially leading up to and during the Civil War, including: Robert E. Lee (General of the Confederate Army), Jefferson Davis (President of the Confederate States of America) and Zachary Taylor (General and 12th President of the U.S.). In 1824 the site for Fort Gibson was chosen because it is strategically located at the confluence of three major waterways in the region: Grand, Verdigris and the Arkansas Rivers. At the time it was the most western fort on the American frontier. The fort’s mission was “to protect the nation’s southwestern border and to maintain peace on the frontier, particularly between the feuding Cherokee and Osage.” After the 1830 passage of the Indian Removal Act, the fort “became increasingly involved in the removal of eastern tribes to Indian Territory.” The Fort also provided troop deployments to Texas when Americans in Texas were rebelling against Mexico. During the Civil War, the fort served as a Union base of operations. For more than sixty years the fort served the country until 1890 when the site was abandoned. After the abandonment, many of the buildings fell into disrepair. In the 1930s much of the log fort was rebuilt and many of the surrounding buildings repaired. Today, what is the most fun about Fort Gibson is that it is not a glitzy tourist destination – it offers visitors an honest and refreshing ruggedness not found in many historic sites. If you want a real treat to start a conversation with a volunteer to hear some interesting stories and learn more about the people who lived and worked at Fort Gibson. What’s the Giant Forest Museum? 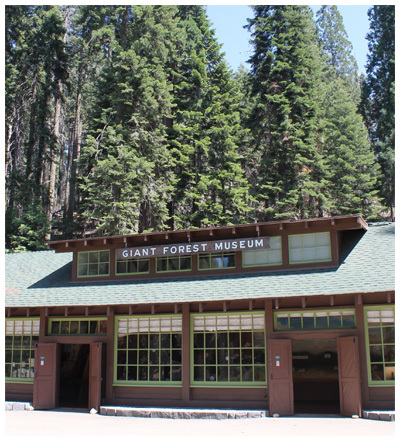 The Giant Forest Museum is the best place to learn about giant sequoias. The museum is located in the Giant Forest of Sequoia National Park. The Giant Forest is a plateau of just several square miles that is home to the largest trees on the planet. Inside the museum, visitors will discover interpretive exhibits all about these magnificent trees. Rangers are on hand to answer questions, provide maps and help point folks in the right direction. The Museum is also the central transit point for the park’s shuttle system. Across the street check out the Beetle Rock Education Center, a hands-on place to learn more about nature for all ages. My name is Mark. I’m an interpretive guide, tour director, and storyteller. I help outdoor travel companies succeed by leading itineraries that are experiential, engaging, and fun. My guiding/tour focus is on the American Pacific Northwest & California. I also write about travel that celebrates learning and a zest for life. My passion is connecting people with amazing stories and places. Let’s go exploring! Copyright © 2019 Tour Guide Mark – Let's Go Exploring!